Ace Drummond was an aviation comic strip, written by Eddie Rickenbacker and illustrated by Clayton Knight, an aviation author and illustrator - click the image to see a larger version. (Clayton's daughter, Hilary Knight, illustrated Kay Thompson's Eloise children's book series among other books.) 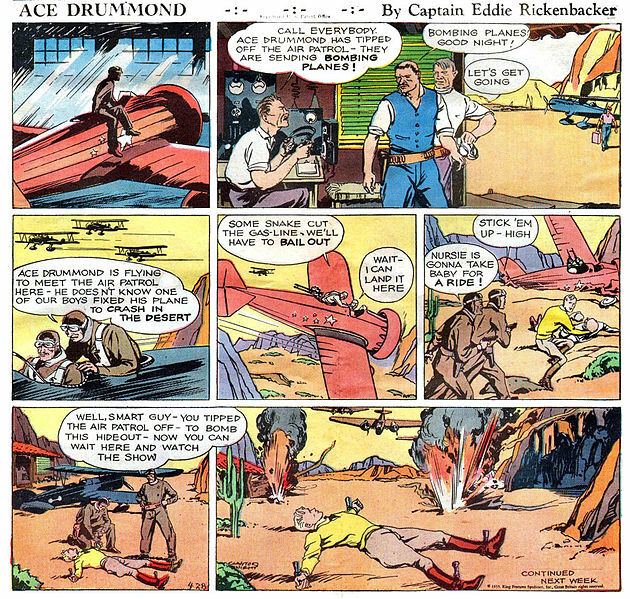 The comic strip centered on Ace Drummond and told of his adventures around the world as he used his barn pilot skills to defeat evil-doers of the skies. He was accompanied by his co-pilot Dinny and mechanic Jerry. Knight was known for his excellent plane-drawing skills, but he notably lacked them for drawing people. His fantastic flight scenes made up for that. Ace Drummond ran from 1935-1940 on the Sunday page, and at one point the strip ran in 135 newspapers. In 1936, Ace Drummond became a film serial. In the movie version, Ace is a pilot who works out of Washington D.C. He is sent to Mongolia to locate a mysterious villain named The Dragon, who is trying to prevent an airline company from putting an airport there. (The real Eddie Rickenbacker owned Eastern Airlines.) Amelia Earhart visited the set of the movie and watched the second episode being filmed, which brought great publicity to the film. Each episode began with a comic strip summary of what had happened in the previous one. This was the beginning of a trend away from using text at the onset of a movie. In another comic strip, Lil Abner (1934-1977), written and drawn by Al Capp, special appearances were made by World War 1 ace Cap'n Eddie Ricketyback. In Lil Abner he is depicted as a frail old man who pilots Trans-Dogpatch Airlines. He battles his old nemesis Baron Ludwig Von Henhausen. Eddie Rickenbacker is featured in the 1955 movie The Court-Martial of Billy Mitchell, which dramatized the real story of United States Army General William Mitchell, who is often called the father of the Air Force. Mitchell was court martialed in 1925 for insubordination because he accused Army and Navy leaders of mismanagement when they invested in battle ships not aircraft carriers. Eddie Rickenbacker testified in his defense and, in the movie, Tom McKee plays Richenbacker. In 1982, the first episode of Voyagers aired, a science-fiction time-travelers television show, which featured Eddie Rickenbacker. In it, the two main characters, Phineas and Jeffrey, help him defeat the Red Baron. Peter Frechette (Facts of life, Taxi, Hill Street Blues, etc.) played Rickenbacker. Todd Snider, an American singer-songwriter, wrote a song in 2009 called Money, Compliments, and Publicity based on the statement made by Eddie Rickenbacker: "Man has reached the pinnacle of success when he is no longer interested in money, compliments or publicity." Finally, Eddie Rickenbacker is the distant cousin of Adolph Rickenbacker who co-founded Rickenbacker Guitars. He chose the name because of its association with the ace pilot. This "beyond the book article" relates to Enduring Courage. It originally ran in June 2014 and has been updated for the May 2015 paperback edition.